Active professionals, working dads and moms, homemakers, students, seniors, energetic teens and kids–we’re diverse, yet united as we learn to live and love the Jesus way, together. God’s given us great purpose. We get involved. Friendly, authentic, biblical and relevant–we welcome you into a growing family of faith, where we challenge each other to honor God and serve Him with your best in all of life. Jesus brings people to Life. 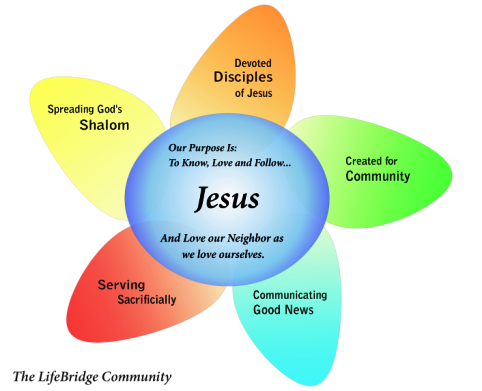 We experience life at its fullest & best as His deeply devoted disciples, created for community, communicating Good News of new life in His Kingdom, serving sacrificially and spreading God’s shalom--peace with justice for all. Together, God's making us a vibrant family of faith that reflects His amazing grace and holy truth. Changed lives. Mended homes and marriages. We help heal and change our community. As God changes us within, the transformation spills over and out! Core to our vision is our commitment to reproduce and plant new, healthy churches. We envision a growing network of Jesus-centered, Anabaptist families of faith that penetrate and transform real people, and our schools, workplaces and neighborhoods where we live and work. By God’s grace, each church birthed will reproduce itself – something like strawberry plants sending out shoots that take root in good soil nearby. Working together, we will advance God’s kingdom in East Central Ohio and beyond. A wonderful diversity of backgrounds are active in our LifeBridge family–Mennonite, Methodist, Baptist, Catholic, other denominations or none at all. LifeBridge affiliates with the Mennonite Church and Anabaptist Christians worldwide. Churches in this faith tradition are known for genuinely living their faith–they’re biblical, relevant, and Jesus-centered, focused on living His brilliant "red letter" bringing repentance, laughter, healing and hope. We strive to “walk the talk” daily, putting Jesus’ genuine love and truth in action in ways that make a difference in our families, community and world. Questions? Simply speak with Pastor Chet.